Extremely high temperatures and humidity are rolling in, and this summer, your family is likely to find themselves by the pool, at the beach, on a boat, or at the lake. Playing in the water can be a great way to keep kids active and cool them down, but drowning poses a serious danger to young children. Nearly 1,000 kids die in drowning incidents each year. These critical situations can be avoided by employing a few safety measures. Learn to swim. Are you fearful of the water, or simply not a confident swimmer? It may be wise to take swimming lessons as an adult. In an emergency situation, it may be up to you to help a child to safety, and feeling confident in the water can make all the difference. Watch the under-five set closely. Children under five can drown in less than two inches of water. Even if your child is playing in a shallow kiddie pool, is splashing in the shallow end of a pool, or is simply splashing by the water’s edge on the beach, a child can fall or roll into an unsafe position that would submerge her nose and mouth in the water. Watch your kids closely to make sure they’re always in a safe position. Do you have a pool at home? Remember to fence it in, preventing kids from playing near or in it unsupervised. Teach kids about water safety. Kids should never be allowed to run near the edge of a pool, or push one another. Slipping on a wet surface is likely, and the chances of falling into the water are too great to risk. Remind your kids to dive only in areas marked specifically for diving. And when your kids play near the ocean’s edge, they should face the surf, which gives them a stronger chance of remaining upright if a wave hits. When waves become too large, or thunder threatens to roll in, pack it in! Proper flotation devices are key. Planning to go boating this summer? A Coast-Guard approved life vest must be worn when on board a boat. When kids aged 3 to 6 are just learning to swim, they may begin to take risks they’re not quite ready for. 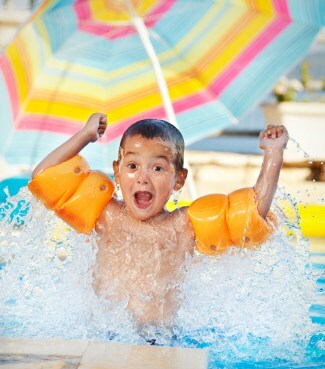 Flotation aids can help to buoy your child if he begins to lose control. This list of flotation devices is comprehensive and breaks down each device by proper usage, age, and weight. Water temperature matters. Adults may enjoy the heat of a hot tub, but temperatures over 140 degrees can scald a child under five, whose skin is thinner than an adults. And temperatures under 70 degrees can be very uncomfortable for young kids. Body temperature drops more quickly in the water than on land, and a safer temperature for kids is between 82 and 86. Many pools are geared toward this temperature range, and the ocean begins to head toward this range as summer sets in. And your own response during emergencies is possible the most effective. If you encounter a distressed or unconscious child in or near water, pull the child to safety while calling out loudly for another adult to dial 911. If the child is not breathing, start CPR if you are trained. If not trained, ask the emergency operator for directions. Your actions can make a life-saving impact. Superb post! water safety is important in everyone’s life, thanks for sharing.